How blessed we have been to have this time of pilgrimage together in Rome! Many thanks to our superiors and the sisters in our local communities who made this trip possible. It is hard to put into words how blessed we have been to share this time together. Our final day in the Eternal City provided us the opportunity for the unique privilege of a visit to the Sistine Chapel and a tour of part of the Papal Palace. Our guide for the tour was Sister Melanie, a Felician Franciscan Sister, who works for the Secretary of State of the Holy See. Day 21 Nothing like putting in two spectacular things in one day! We spent the morning literally let loose in the Vatican Gardens. Sister Mary Angela (temporarily) traded in her passport and received an official Vatican Gardens badge, so we could pretty much go anywhere. Beautiful trees, hedges, paths, flowers, statues, grottoes...and after an entire morning there, we were only about halfway through it! We started the day at Trevi Fountain to meet Fr. Ehli who shared some history on the fountain and then headed to Casa Santa Maria to join him for Mass. The Casa is a home for American priests who are studying in Rome. After a beautiful Mass, we journeyed to the Congregation for the Evangelization of Peoples for a talk and tour. It was a joy to hear about how the Congregation works with these young Churches all over the world providing support as they grow. It rekindled in our hearts a greater zeal to spread the Gospel, pray and support the missionary activity of the Church. We also visited the Chapel there, dedicated to the Holy Magi where they have a habit from St. Therese of the Child Jesus and the Holy Face underneath a painting of St. Francis Xavier both of whom are patrons for the Missions. Today is Sister Mary Hanah's birthday, so we celebrated first by going to Mass at the Basilica of St. Lawrence Outside the Walls. The statue of Pope Pius XII commemorates the day he drove out to pray with the people of this neighborhood who had suffered from a bombing during the war (aimed at the railway, but damaging homes and part of the Basilica too). It is difficult to give a sense of the Basilica, as each photo only shows one or two elements. The tomb of Blessed Pope Pius IX is in the lower level. We began the day by visiting old places in a new way. 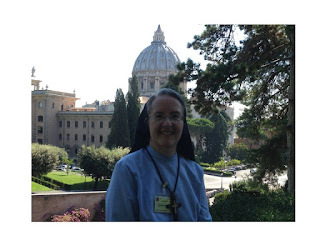 Sister Mary Agnes, Sister Mary Hanah, and Sister Mary Maximilian went to Saint Peter's Basilica first thing in the morning in order to go up to the cupola. The climb up was more of a challenge than usual: there were no lights to guide their steps, so the Sisters went on in the dark. This sounds like a spiritual lesson, and maybe it was... and they made it to the top. Meanwhile, on the other side of town, after attending Mass at the Gesu', Sister Karen, Sister Clare, and Sister Mary Angela were discovering how quiet the streets are first thing in the morning, and how lovely with the cool air and light streaming into the streets. In the afternoon, we visited the Basilica of San Clemente, in which photos are not allowed. From there we went to the Church of the Four Crowned Martyrs, where we prayed and studied the communion of the Saints as portrayed in the apse.